March Madness Isn't the Only Thing to Celebrate This Month! | Winners Drink Milk! It’s also National Nutrition Month and Registered Dietitian Day! Excited to celebrate herself, Dietetic Intern Karina Bodemeijer decided to quiz our dairy dietitians on what inspires them. Here’s what she found out. The Academy of Nutrition and Dietetics created National Nutrition Month and it is celebrated annually during the month of March; this is a chance for us to focus our attention on the importance of making informed food choices, promoting nutrition education, and developing a lifelong, healthy eating style. Another special part of this month is RDN Day, or Registered Dietitian Nutritionist Day; this day is recognized annually on the second Wednesday of March. This is an opportunity to celebrate our registered dietitians and the commitment they have for caring for the health and wellness of others and all of the effort they put into advocating for scientifically-based food and nutrition information. As an aspiring dietitian, I am excited to be a part of this community in the future. I am really looking forward to using my education and experiences to provide nutrition information to patients and clients! Question: What initially inspired you to pursue a degree in dietetics? Michelle: I love food and enjoy science, dietetics allowed me to blend the two. Hanna: I enjoy science and worked in the kitchen of a long-term care facility in high school and early college. After learning to prepare snacks and supplements for the residents there, I became more curious about how food affects our health. Apparently I asked too many questions, and soon the staff dietitian was referring me to programs. Question: How are you using your credential in your current role? Michelle: In community nutrition, I promote dairy facts, science, food and nutrition in one great product that is always consistent, begins with only one ingredient (MILK) and is a great source of nutrition in any form. Hanna: I have an opportunity every day to help people learn more about the incredible value dairy foods bring to a balanced, sustainable diet. As a Registered Dietitian, I’ve spent my career breaking down the science and helping individuals understand how their food choices affect their health and quality of life. I get to specialize a bit now, concentrating on dairy. Question: What has been one unexpected joy in your job? Michelle: Working and learning from Farmers! Their passion is second to none and their dedication is top shelf! Hanna: I have always had the upmost respect for farmers. It’s a calling. 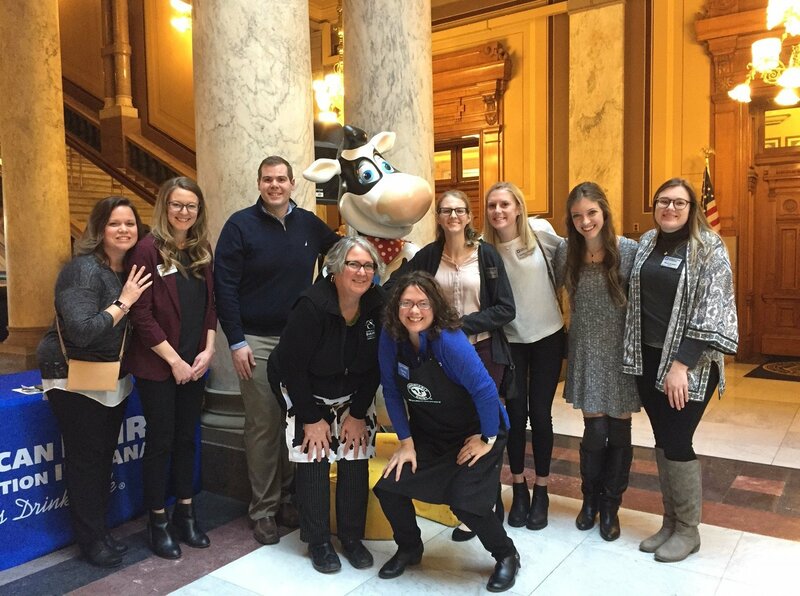 But I never could have anticipated how much joy it gives me to work for Indiana’s dairy farm families. 24 hours a day, 365 days a year they put everything into caring for their cows and protecting our natural resources, in order to feed the world. No one works harder. Question: Do you have any advice for newly registered dietitians or future dietitians? Michelle: Learn all you can about agriculture and the food that sustains us. Cooking is vital, before someone will allow you to help them, you must be able to provide them the tools- cooking is the conduit to the conversation, table and change. Hanna: Don’t ever forget to listen. We have so much knowledge (and plenty of opinions) about what people should eat and sometimes just blurt it out. However, none of that matters if they don’t have money for food, the skills to prepare it, or any enjoyment from it. Second, be open and reserve judgment. It’s our job as dietitians to sort the myths from the facts and then help the rest of the world make food choices based on their individual needs. One size doesn’t fit all and no diet is perfect. Thank you registered dietitians for your commitment to your profession. If you know a registered dietitian in your life, thank them for the hard work that they do in promoting nutritional well-being!